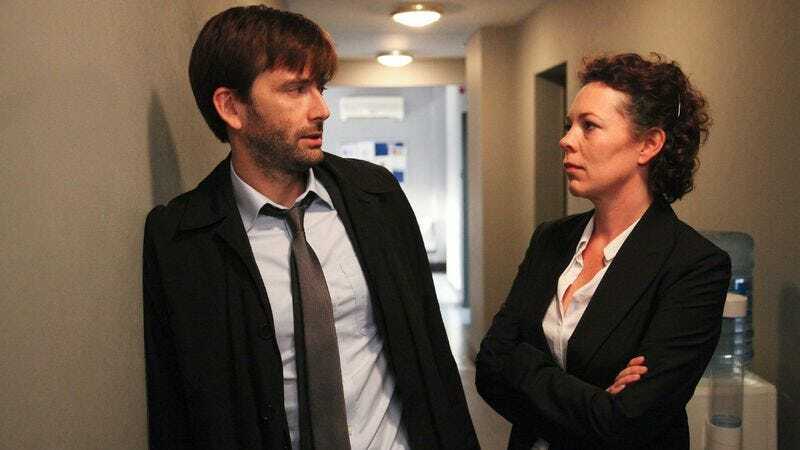 Now this is more like it: Only two weeks left of Broadchurch means that some answers in last week’s humungous pile of questions are finally uncovered. The revelations about Sandbrooke, to say nothing of Susan Wright’s past and her actual connection to Nigel, make for the most unsettling episode since the premiere. D.I. Hardy (David Tennant) has maintained from the beginning that literally anyone would be capable of murder under the right (or wrong, more like) circumstances. 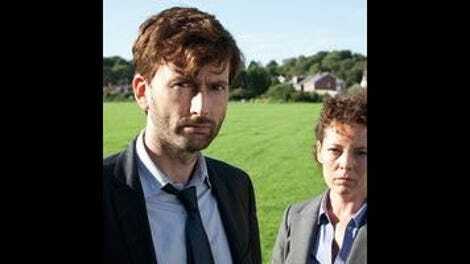 For weeks now Broadchurch has exposed buried pasts and hidden sides of its residents in the search for the murderer of 11-year-old Danny Latimer. But what does what we find out about others affect how we feel about that person? Or even ourselves? Nigel (Joe Sims) learns the horrific truth about his origins, thanks to the cruelest move Hardy’s pulled yet: showing him the newspaper clippings that contain the nightmarish story of Susan Wright (Pauline Quirke) and her family. Since Nigel is the biological son of Wright and the monster she was married to, is he doomed to become a monster as well? Is he worse off now that he knows his real history? It certainly seems that way. Similarly, Maggie (Carolyn Pickles) and Ollie (Jonathan Bailey) pin D.I. Hardy down to reveal the truth about what happened in his previous case, Sandbrooke. As some predicted, it wasn’t Hardy at all, but his D.S. who lost the crucial piece of evidence (the pendant with the murderer’s fingerprints) when she was out celebrating with her lover. Hardy covered up for her because she was his wife. The reporters now have more respect for Hardy than ever: This one story has irrevocably colored their perception of him, especially when they realize that the stress of Sandbrooke probably caused his heart condition. Ollie stresses, “People need to know about this.” Hardy counters: “Do they? Really? Why?” In Hardy’s case, revealing the truth doesn’t have any effect on him at all: He’s still sick, his family is still broken, and the Sandbrooke killer is still out there. In Nigel’s case, the revelation of the truth is devastating. For Hardy, it’s inconsequential. The Latimers are somewhere in the middle, stuck in limbo until they learn the truth about who killed their son. Unable to move forward, they turn to Pastor Paul (Arthur Darvill) for comfort, as Beth (Jodie Whittaker) still can’t be positive about the new baby, and Mark (Andrew Buchan) tries to believe she will be eventually. Paul continues his streak of being awesome at consoling Broadchurchers, as he offers: “God has sent you not what you want, but what you need.” Later, as the Latimers find some rare moments of happiness at Beth’s first ultrasound, this seems to be true. Susan says that once Death gets its grip into you, it’s impossible to break free. But the Latimers, focusing on new life, incredibly seem to still possess some hope. In the now-long list of Broadchurch secret outings and activities (extramarital affairs, young boy in-fighting, paintballing), another is revealed, and it’s one of Danny Latimer’s. He, Nige, and Dean (Jacob Anderson) used to go trap pheasants, which the Latimers learn when Dean comes for dinner. Dean explains that Danny said his parents knew, to which Mark shakes his head somberly. “No… we didn’t know.” Even Danny, the victim, seems to have possessed a non-innocent side: Where was he headed out on his skateboard that night? D.S. Ellie Martin (Olivia Colman) wants to know how Susan was unaware of what kind of nightmare she was living with, who was hurting her children: “That man in your own house, how could you not know?” The pheasant-hunting could be benign in comparison, but as Danny’s killer remains hidden, no lie or secret story seems inconsequential at this point. All we really know is what people tell us (remember Beth’s plea in episode three: “You never really know anyone”), and if we love them, we believe them, for good or ill. At the end of the episode, it’s 2:00 in the morning, and almost no one is asleep in Broadchurch as they ponder the vast valley between lie and truth. Props to Joe Sims, who plays Nigel, for switching from a doofus to a homicidal maniac in mere moments. I also appreciate the backstory behind his siphoning of the tractor fuel and cutting the barbed wire from the premiere, the first time we saw Hardy: Thank God that’s cleared up! Fun with Hardy and Miller: Love his beautiful reverse psychology ploy to get her to take over the case but let him stay on. Also note how much smoother Miller’s second staff meeting went than her first, and her heartrending stumble over “We’re… I’m continuing to question…” She also proves herself to be a formidable interrogator, and her deep knowledge of the town (down to what you can actually see from the cliffs) gives her quite an advantage.